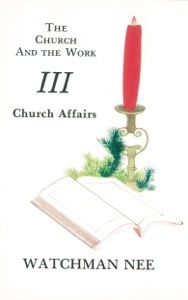 Publisher: Christian Fellowship Publishers, Inc.
Church Affairs is the second volume in the The Church and the Work series by Watchman Nee. The purpose of God is to establish Christ—and not just the personal Christ but also the corporate Christ, which is the Church: “as the body is one, and hath many members, and all the members of the body, being many, are one body; so also is the Christ” (1 Cor. 12.12 Darby). The work of the Holy Spirit in these past two thousand years has been centered on building this body of Christ. We will fail God in seeing His purpose and fail the Holy Spirit in cooperating with His work if we are not “holding fast the Head, from whom all the body, being supplied and knit together through the joints and bands, increaseth with the increase of God” (Col. 2.19). The body of Christ is not only most spiritual but also most practical. It is an earthly testimony as well as a heavenly body. All its spiritual principles must be and can be practiced in a local assembly. Here in these pages, therefore, we shall find that Watchman Nee shares with us the practical aspects of the assembly life. He touches on such practical matters as authority in the church, ministry in the church, church fellowship, church meetings, and the boundary of a local assembly. It is important for the reader to remember that this volume emphasizes only the practical side of the Church, and hence concentrates on the life of the local assembly. There is another side of the Church—that of the spiritual principles inherent in the Church universal—which is not the subject of this book. To maintain the right balance and to obtain the whole concept of the Church, both the principle and the practice, both the universal and the local, must be received and kept. For it must never be forgotten that a new wine-skin is for containing the new wine; and therefore the first without the second is meaningless. May the Head of the Church find himself expressed corporately among His people.